Videolänge: Total running time 91 minutes. The Virtual Test Prep DVD Series provides a comprehensive aviation ground school to prepare pilots for the FAA Knowledge Exam and help them become better, safer pilots. ASA’s newest DVD ground school, Helicopter Fundamentals, guides viewers through the important concepts and vagaries of helicopter flight. This award-winning production makes explanations come to life with in-flight demonstrations and the latest 3D animated graphics. Aerodynamics are covered in detail from retreating blade stall to autorotation. Cockpit point-of-view footage helps viewers experience maneuvers from the pilot’s perspective. 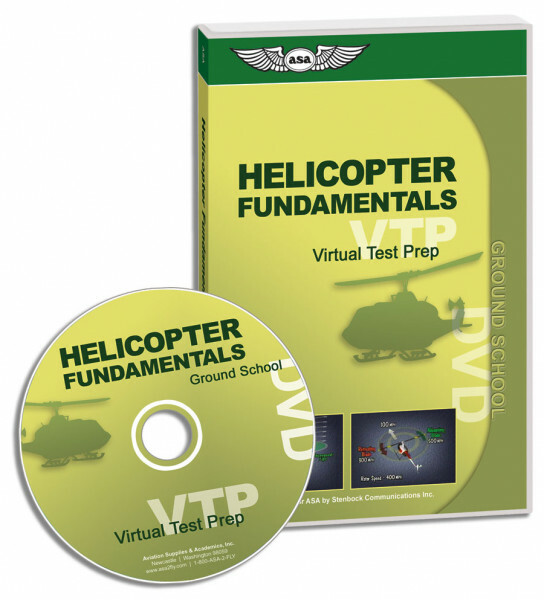 Helicopter Fundamentals supplements the airplane Virtual Test Prep ground school courses. Complete both the airplane and helicopter courses to prepare for private pilot, instrument rating, commercial pilot, or flight instructor (CFI) FAA Knowledge Exams. Used together, the courses provide everything needed to ace the Helicopter FAA Knowledge Exam. Television or computer DVD player. Compatible with both PC and Macintosh DVD systems.